Download "FREQUENTLY ASKED QUESTIONS GRADUATE PROGRAM. Q: I have an engineering/architecture/other background do I qualify to study construction management?" 1 FREQUENTLY ASKED QUESTIONS GRADUATE PROGRAM General Questions Q: I have an engineering/architecture/other background do I qualify to study construction management? A: Yes; most of our graduate students come with backgrounds like yours, and so it is not unusual to have students with undergraduate backgrounds different than construction management. Yet, your application is going to be reviewed thoroughly by our Graduate Instruction Committee, which will make a determination whether your application materials test scores, undergraduate background and grades, personal statement (essay), recommendation letters, and your entire profile are a good fit to our program or not. Q: I am working full-time now. Does your program offer online/evening classes? A: Unfortunately, not yet. Our program is a residence-based program in which students are required to take on-campus classes. 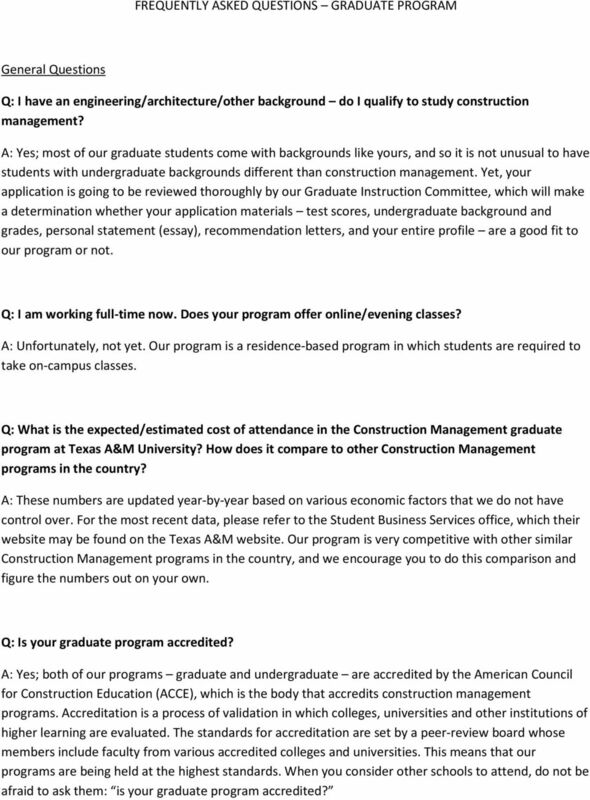 Q: What is the expected/estimated cost of attendance in the Construction Management graduate program at Texas A&M University? How does it compare to other Construction Management programs in the country? A: These numbers are updated year-by-year based on various economic factors that we do not have control over. For the most recent data, please refer to the Student Business Services office, which their website may be found on the Texas A&M website. Our program is very competitive with other similar Construction Management programs in the country, and we encourage you to do this comparison and figure the numbers out on your own. Q: Is your graduate program accredited? A: Yes; both of our programs graduate and undergraduate are accredited by the American Council for Construction Education (ACCE), which is the body that accredits construction management programs. Accreditation is a process of validation in which colleges, universities and other institutions of higher learning are evaluated. The standards for accreditation are set by a peer-review board whose members include faculty from various accredited colleges and universities. This means that our programs are being held at the highest standards. When you consider other schools to attend, do not be afraid to ask them: is your graduate program accredited? 2 FREQUENTLY ASKED QUESTIONS GRADUATE ADMISSIONS Q: Is professional experience required for admission into the program? What is counted as professional experience? A: No, but professional experience may add points to your application. Professional experience refers to any full-time job carried out after you obtained your Baccalaureate degree. This means that any sort of internship, co-op, summer job, student worker position, etc., are not counted as professional experience. Q: The website states that the official deadline to apply for the graduate program is February 15 of each year. How flexible are you with this deadline? 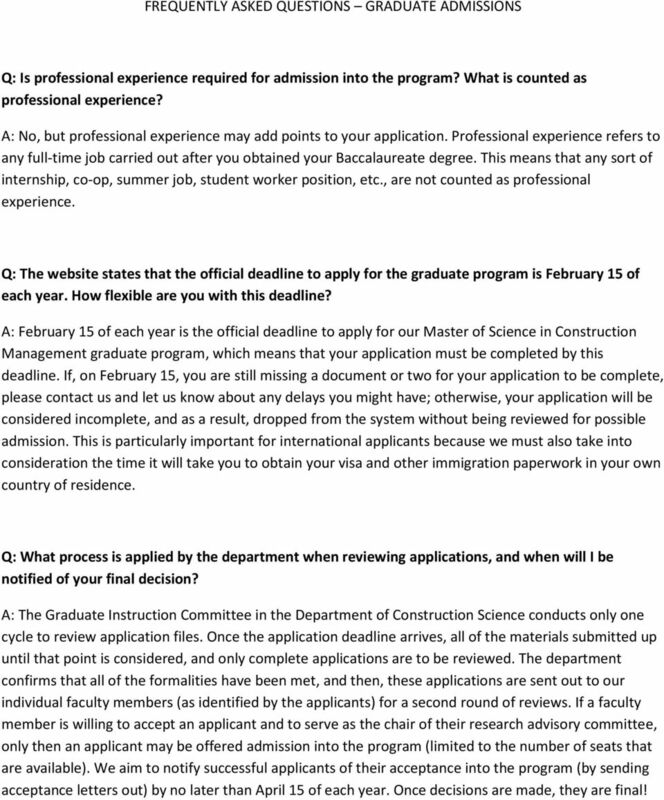 A: February 15 of each year is the official deadline to apply for our Master of Science in Construction Management graduate program, which means that your application must be completed by this deadline. If, on February 15, you are still missing a document or two for your application to be complete, please contact us and let us know about any delays you might have; otherwise, your application will be considered incomplete, and as a result, dropped from the system without being reviewed for possible admission. This is particularly important for international applicants because we must also take into consideration the time it will take you to obtain your visa and other immigration paperwork in your own country of residence. Q: What process is applied by the department when reviewing applications, and when will I be notified of your final decision? A: The Graduate Instruction Committee in the Department of Construction Science conducts only one cycle to review application files. Once the application deadline arrives, all of the materials submitted up until that point is considered, and only complete applications are to be reviewed. The department confirms that all of the formalities have been met, and then, these applications are sent out to our individual faculty members (as identified by the applicants) for a second round of reviews. If a faculty member is willing to accept an applicant and to serve as the chair of their research advisory committee, only then an applicant may be offered admission into the program (limited to the number of seats that are available). We aim to notify successful applicants of their acceptance into the program (by sending acceptance letters out) by no later than April 15 of each year. Once decisions are made, they are final! 3 Q: The GPA in my own country is calculated based on a different scale than the 4-point scale required. How do I convert my grades into your scale? A: This is something we do over here, so you do not need to worry about converting your grades into ours. Just submit your transcript as is, and our software will make the conversion of your grade scale into our scale, as needed. Q: What should I write about in my essays? A: The application process requires an applicant to submit two (2) separate essays. The first one should include anything you see relevant for the Graduate Instruction Committee in the Department of Construction Science to consider when we review your application. We recommend that you provide us with a good reasoning as of why you are interested in studying construction management, and why do you deserve getting admitted. An additional requirement for this essay is that you identify three faculty members in the program, and describe what research you would like to conduct under their guidance (in general terms). The second essay requires some more details about your research topic idea. Here, we ask that you explain your proposed research idea in more detail, what is the need to study this specific topic you propose, what contributions can your research make, what data will be needed to study the topic and how it is going to be obtained, and then tie it all back to your own qualifications and background that make you capable of studying the proposed topic. In order to be able to write it well, we recommend that you carefully review the publication records and research interests of our faculty, and write about topics that fall within their areas of interest. 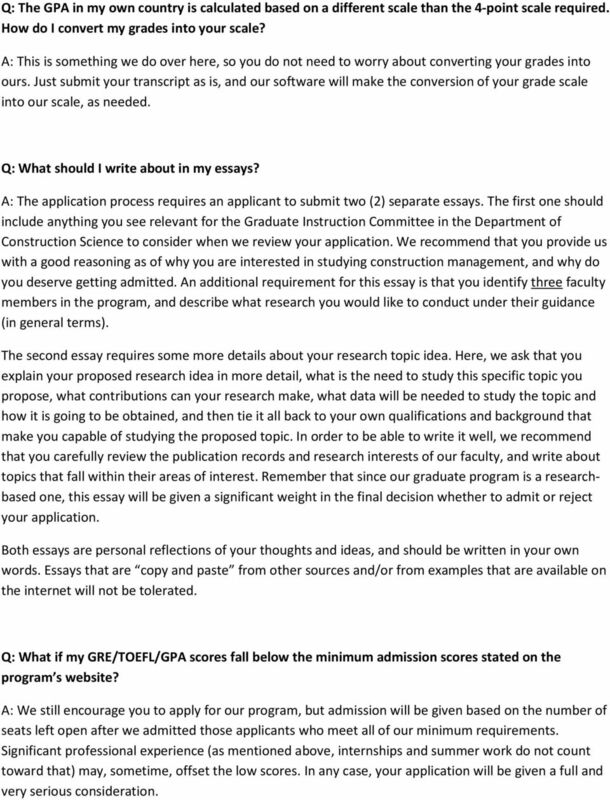 Remember that since our graduate program is a researchbased one, this essay will be given a significant weight in the final decision whether to admit or reject your application. Both essays are personal reflections of your thoughts and ideas, and should be written in your own words. Essays that are copy and paste from other sources and/or from examples that are available on the internet will not be tolerated. Q: What if my GRE/TOEFL/GPA scores fall below the minimum admission scores stated on the program s website? A: We still encourage you to apply for our program, but admission will be given based on the number of seats left open after we admitted those applicants who meet all of our minimum requirements. Significant professional experience (as mentioned above, internships and summer work do not count toward that) may, sometime, offset the low scores. In any case, your application will be given a full and very serious consideration. 4 Q: I have spoken English from the time I attended elementary school. Do I still need to take TOEFL? A: Yes, unless you are exempt from taking it according to the University Rules. Applicants coming from English-speaking countries such as Canada (except Quebec), United Kingdom, Ireland, and Australia (India is not included in this list!) are exempt from this requirement. An applicant who has already obtained another degree (baccalaureate of higher) from a university in the United States is also exempt from this requirement. All other applicants must take TOEFL. Q: I have problems submitting my documents to the online admission system. What do I need to do? A: The department of Construction Science does not collect any documents directly from the applicants. Everything needs to be submitted through the online application system. In case you face problems using the system, please contact the Texas A&M Office of Admissions, which their address, phone number, and office hours may be found on the Texas A&M website. 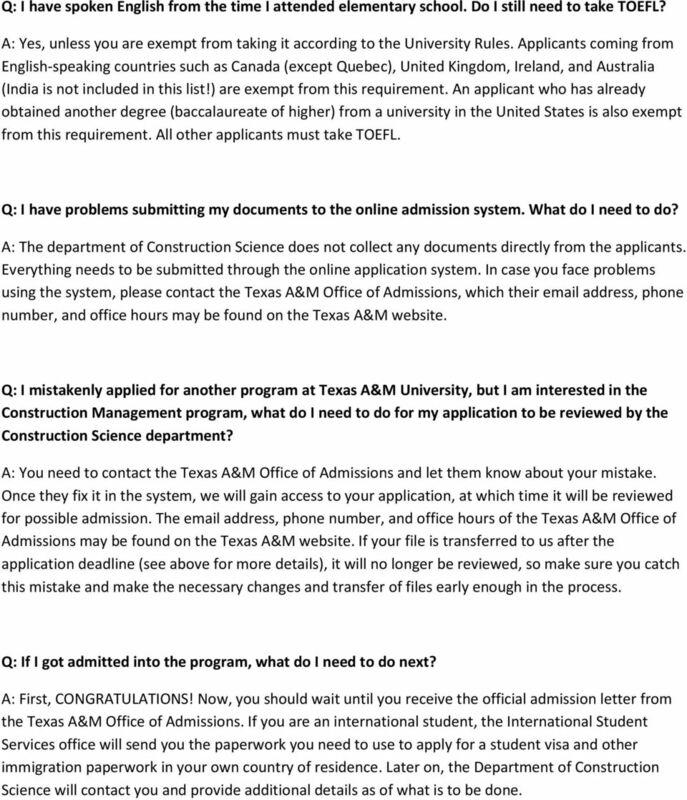 Q: I mistakenly applied for another program at Texas A&M University, but I am interested in the Construction Management program, what do I need to do for my application to be reviewed by the Construction Science department? A: You need to contact the Texas A&M Office of Admissions and let them know about your mistake. Once they fix it in the system, we will gain access to your application, at which time it will be reviewed for possible admission. The address, phone number, and office hours of the Texas A&M Office of Admissions may be found on the Texas A&M website. If your file is transferred to us after the application deadline (see above for more details), it will no longer be reviewed, so make sure you catch this mistake and make the necessary changes and transfer of files early enough in the process. Q: If I got admitted into the program, what do I need to do next? A: First, CONGRATULATIONS! Now, you should wait until you receive the official admission letter from the Texas A&M Office of Admissions. If you are an international student, the International Student Services office will send you the paperwork you need to use to apply for a student visa and other immigration paperwork in your own country of residence. Later on, the Department of Construction Science will contact you and provide additional details as of what is to be done. 5 Q: If I got rejected from the program, what should I do? A: If you are still interested in studying with us, you need to correct the deficiencies identified in your application, and re-apply for the next academic year. In most cases it will require you to re-take the GRE, TOEFL, etc., or to re-write your essay (or essays) in order to improve your scores; in other cases, it is just a matter of a mismatch due to low undergraduate records, or limited background or interest in the field of study. Q: I did not receive an offer for financial aid from the department? Am I still eligible? A: Unfortunately, the department has limited funds to offer as financial aid, and so not all applicants will be offered funding. The way it works is that all of our applicants are ranked based on the data they provided in their application; only those applicants ranked at the top of our list are typically offered financial aid. Our program is very competitive, and we can offer funding only to those applicants with the highest scores. Q: How do I apply for an open position in the department? A: If an open position for a Graduate Teaching Assistant (GAT), Graduate Non-Teaching Assistant (GANT), or Graduate Research Assistant (GAR) becomes available, we typically send out an to all of our students (new and current) and ask them to apply for the opening by filling out and submitting Form MSCM-03 to the department by a certain deadline. If that is the case, you will be notified. Q: Who do I need to contact in case I have an issue regarding immigration? A: The International Student Services (ISS) is the office that deals with these issues, as well as issues related to visas, legal documentation, procedures for entering/leaving the country, tax issues, work permits, health insurance, and anything else that is related to immigration. Their address, phone number, and office hours may be found on the Texas A&M website. 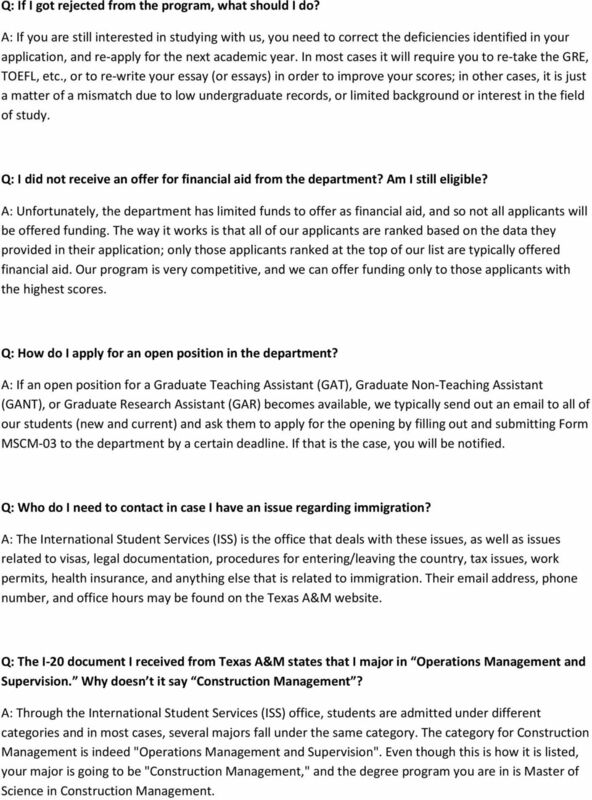 Q: The I-20 document I received from Texas A&M states that I major in Operations Management and Supervision. Why doesn t it say Construction Management? A: Through the International Student Services (ISS) office, students are admitted under different categories and in most cases, several majors fall under the same category. The category for Construction Management is indeed "Operations Management and Supervision". Even though this is how it is listed, your major is going to be "Construction Management," and the degree program you are in is Master of Science in Construction Management. 6 Q: Does the graduate program offered by the Department of Construction Science at Texas A&M University is a STEM-recognized program? A: Unfortunately, our graduate program is not a STEM-recognized program. Our program is accredited by the American Council for Construction Education (ACCE), which reflects on the high quality of our program, but this does not provide our students the benefits of being a STEM-recognized program. Frequently Asked Questions about Program Placement Fulbright Grantees Studying in the United States Table of Contents WORKING WITH YOUR PLACEMENT SPECIALIST... 2 I really want to go to a top university. Congratulations on your decision to apply to the Materials Science & Engineering program at Stanford University. List of FAQs. 1. What is the application procedure? GRADUATE ADMISSIONS PROCESS: Overview: The graduate admission process is a shared responsibility of the Office of Graduate Admissions and the academic department in which the graduate program resides.